No pumpkins were harmed in the making of these tarts. Nevertheless, the warm flavours of fall shine through in healthy, date-sweetened treats. 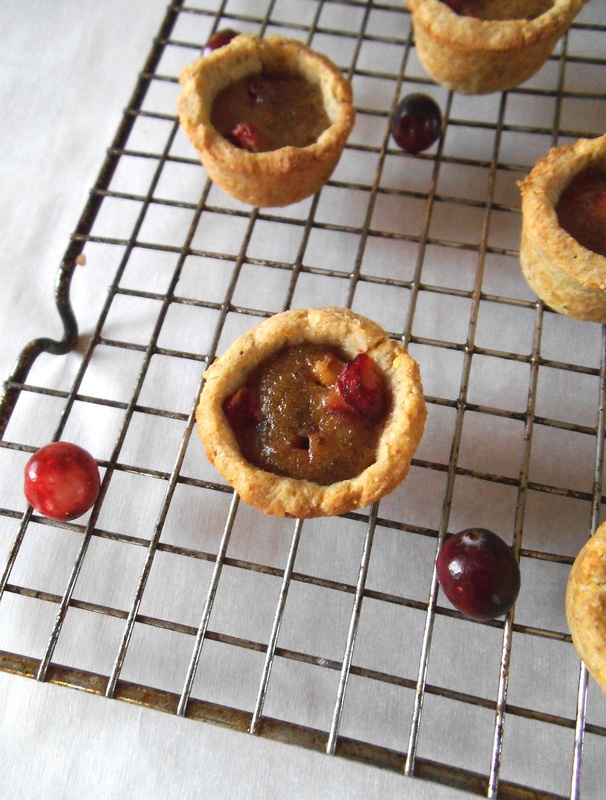 But these cranberry date tartlets are not just for health nuts. Finicky eaters might notice that the crust is unusual, but oddly enough, my normally skeptical children gave them a big thumbs up! The rich, sweet flavour made my mouth glad to eat more, and my body seemed to tell me to “eat this, not that.” “That” would be super sweet desserts that are made with white flour and refined sugar. It’s so nice to feel better, not worse, after indulging in something sweet! To make the filling, pour boiling hot coconut milk or other liquid over dates and cover for 10 minutes to soak. Add melted coconut oil and vanilla and blend in food processor or blender until relatively smooth. Add in egg and blend briefly to combine. Meanwhile, in a small saucepan, bring 2 cups of water to a boil and add lentils. Turn heat down to simmer, and cook until very soft, about 20 minutes. Remove from heat and mash lentils until they are the consistency of applesauce, draining excess liquid if necessary. Measure out 1 cup of mashed lentils, reserving excess for another use (such as soup). In a medium bowl, stir together lentils, honey, baking soda, salt, and ground chia seed. Let sit for several minutes before adding the coconut oil and remaining dry ingredients. Stir ingredients together to form a dough and knead until well mixed. Chill for 10 minutes. Preheat oven to 325 degrees F (165 C). Roll out dough on a mat or parchment paper to form a thin crust (about the thickness of a tortilla). Cut into circles to fit into a mini muffin tin (or larger circles for a full size muffin tin). Bake empty crusts for 7 minutes. Remove from the oven. 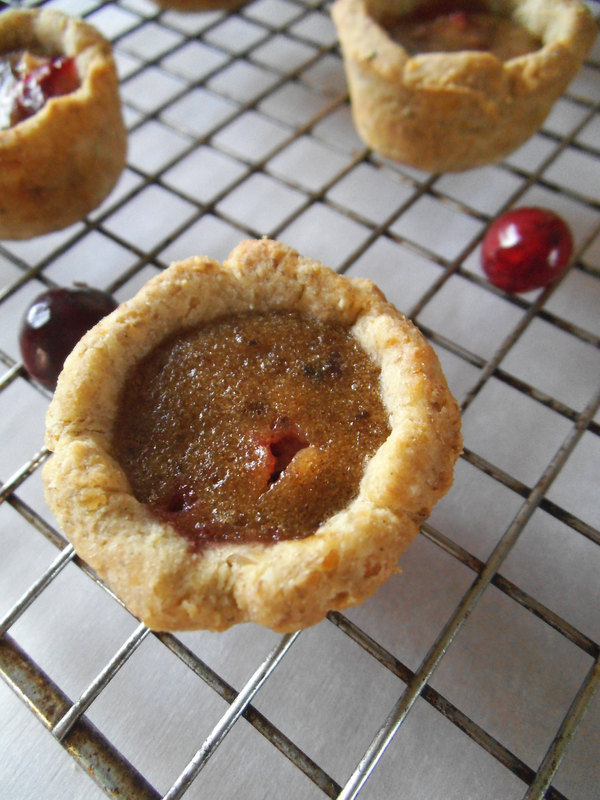 Fill tartlet crusts with a heaping 1/2 teaspoon of chopped cranberries. Pour filling over cranberries. Bake for another 8 to 10 minutes, until filling is set and crust is golden. Let cool before removing from the muffin tin. Serve tartlets at room temperature. Tartlets will also freeze well and can be thawed prior to serving. at Savoring Saturdays, Allergy Free Wednesdays, and Gluten Free Wednesdays. Lovely little tartlets! 🙂 I’m sure they are very tasty! Thank you! We did enjoy them! Yes, I was surprised by how much I liked them. Healthy recipes can be a little unpredictable with how they taste. I’m so intrigued by this crust recipe! And you can leave out the egg to make them vegan. Enjoy! Wow, these look awesome! Thank you for sharing! Thanks! I should make some more for a gluten-free friend of mine. Mmm, dates and cranberries! What a great combination! The crust sounds and looks wonderful as well. Interesting recipe and crust! I’m all for finding ways to eat healthier and feel better ! Your photo is beautiful.. Thanks! You will feel good after eating these. For those of us without dairy issues, can the “1/2 cup coconut milk beverage, almond milk, or water” be just regular milk? I think that hot (but not quite boiling) dairy milk would also work just fine. Enjoy! These sound delicious! I am loving the unusual ingredients too! Featuring your recipe on Allergy Free Wednesday this week, thank you! Thanks for linking up to Savoring Saturdays. Please add the link back in case you are featured! Stumbled and pinned! Hope to see you next week. Wow a doughwith lentils! Genius! Once cooked is it soft or crusty?